Do you want a lean physique like all the top Bollywood stars? Well, working out in the gym and lifting weights won’t work, you need to keep a firm balance between weight training and cardio. When I say cardio it’s not just running on a treadmill. Cardio in itself is a very big word and contains a different set of exercises. However, the treadmill pays a significant role when it comes to cardio exercise. As you might know in all the gyms majority of the people comes only to run on the treadmill and that is why it makes the treadmills very crowded. But you can solve this problem by buying a treadmill for your home. Not always, because in the article, I’ll show you the 10 best treadmills available in India for home and office which anyone can afford. Moreover, I have covered both the advanced and mediocre treadmills. So without wasting much of the time. Let’s find out which treadmill is best for you. Our Top 3 Picks for 2019. It has 3.0HP continuous duty (CHP) DC motor which is sufficient for user weight up to 120Kg. Although it has 3.0HP CHP motor, it consumes less power, 1 unit for one hour of usage as it's a green efficient motor. The Powermax TDA-350 is a great solution to do gym workout at your home or office. The treadmill is lightweight, compact and foldable. Moreover, it has a 7” inch display for showing you speed, time, heart rate + BMI measurement. You can say it yourself that this treadmill has amazing build quality as it can handle weight up to 120kg. Talking about the features, it has an auto inclination up to 0-18% which helps you reduce your weight super fast. Perfect for runners as it can go from 0.8 – 18 km/hr speed. It doesn’t end here if you are someone who loves to play songs while running. Well, the Powermax team got you covered. You can connect your mobile via Bluetooth with the application and enjoy unlimited music. One last surprise for you is, with this treadmill available in India you get a lifetime frame warranty plus 3-year motor warranty and 1-year parts and labor warranty. The TDA-260 treadmill in India by Powermax has premium build-quality and it’s foldable so you can shift it anytime you want. Perfect for runners and athletes as it can go from 0 to 15.8 km/hr. Moreover, it comes with a 2.0 HP DC motor which consumes only 1 unit for 1 hour. Thus, saving you a lot of energy even if you run multiple times on your treadmill. This treadmill is ideal for an everyday workout (for home, office and even in the professional gym). It also comes with WiFi support for you to connect to the Internet. The maximum limit of weight that the treadmill can handle is 120kg and it comes with a lifetime frame warranty and 3-year motor warranty and 1-year parts and labor warranty. The Powermax TDM-98 is a highly affordable treadmill for all those who are looking to make a gym in their home or office. This treadmill is easy to operate and configure. If you are a beginner, you get 12 preset workout programs which you can follow without any prior experience. The treadmill can handle maximum weight up to 90 kg (walking) and 65 kg (running). Moreover, it comes with an AUX and USB cable to listen to music, and wheels for easy transportation. You get a basic LED display for showing all the metrics as calories burnt, speed, distance, time and heart rate. Note: If you love big display screen this might not be the best choice for you. This is a budget treadmill, so you need to compromise on a few things. Lastly, you get a decent running area of 1100*400 mm with a speed range of 0.8 to 14.8 km/hr. The Quantico FS485 comes with a huge running area of 1260mm*420mm on which even a heighted man/woman can run flawlessly. Not only that, it can handle weight up to 115 kg so doesn’t matter if you are bulky it will still give you the best performance. For all the music lover out there, this treadmill comes with an AUX or USB input support to enjoy unlimited music. The 2.0 HP DC motor saves a lot of energy in the long run without compromising on quality. The auto lubrication feature enhances smooth running thus increases the overall lifetime of the treadmill. And, the auto inclination feature helps you burn more calories. 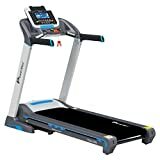 The Powermax TDA-230 treadmill comes with six-level shock absorption and two large Powerflex springs to handle all the weight and still keep your treadmill safe to use. You get a huge LCD display to see and manage your heart rate, speed, distance, calories burned, fat burned and BMI measurement. It has four wheels for transportation so that you can easily shift the treadmill from one place to another without much hassle. Talking about the features, you get an auto inclination of up to 15%, maximum weight handling capacity is up to 115 kg and speed up to 14 km/hr. The downside is you need to install the treadmill on your own by reading the provided manual or watching any video online. And for a heavyweight, the belts get slippery at times. The Quantico FS385 is best for people who don’t like to go to gym and workout on their own terms (anytime in the day). This electronic treadmill is perfect for running or walking to burn calories at your home or office. The 5” inch blue screen LCD display helps you track your heart rate, distance, and total calories burnt. Moreover, this treadmill is not loud at all it produces only 65 DB of sound. And with the 2.0 HP (4.0 HP peak) you can save a lot of energy. The six-level shockproof absorbing technology helps reduce the impact during the running so that you can run with comfort and durability. It doesn’t matter if you weigh 60 kg or 100 kg this treadmill can handle up to 115 kg easily. Not to forget, you get lifetime frame warranty, 3-year motor warranty, and 1-year parts and labor warranty. 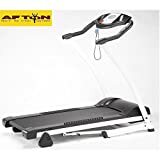 The Afton Xo-100 is a nice premium looking treadmill that has an excellent overall user experience. With keeping advanced athletes in mind, the company has made this treadmill to go up to 12 km/hr of speed. The running width is 400 mm, and the length is 1195 mm. It comes with a rubber grip which prevents you from slipping from the treadmill (nice technology) not only that, this rubber grip helps in reducing the treadmill noise to a greater extent. Talking about the downside, this treadmill is not self-lubricating which I honestly didn’t like provided for the price they are charging. Moreover, the max weight that this treadmill can handle is 90 kg, so if you are someone who exceeds this weight limit, then you need to look out for some other options on the list. 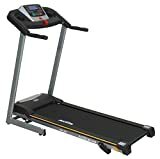 The installation with this treadmill comes for free, and the product comes with a lifetime warranty on frame and 3-year warranty on other parts of the treadmill. This treadmill from Aerofit is made for a professional gym and for those who loves running. Because this treadmill can go as fast as 20 km/hr. It also comes with 12 premade programs, 11 preset, and 1 manual mode to give you an extra bit of customization. The two coat electro frame is made to ensure maximum corrosion and cheap resistance. It has a 1.5 HP motor which can exceed up to 3.0 HP at peak power. Comes with an LCD blue back display with heart rate sensor, time, distance, and calories sensor. Do note that, the width of this treadmill is less compared to the other treadmills in the list. So if you are looking for a wide treadmill, this might not be the best choice for you. However, this is a budget treadmill available in India and it’s evident what they are providing at this price point. The Lifeline 4 in 1 is a non-motorized treadmill specially made for home and office usage. It is not something which you can use in a commercial gym. It has an electronic meter for measuring speed, distance, time and fat burned to give you precise results of your hard work. This is not just a treadmill but, it comes with lightweight exercise equipment that will help you burn fat and calories faster. It has a decent amount of running space for any ordinary heighted man to run comfortably. Surprisingly, it comes with the transportation wheels to give you the portability. The USP of this treadmill is that you get a twister at the back of the device which you can use post workout to relax your body parts. Cool, isn’t it? One thing to note here friends is, you don’t get any free installation service with this treadmill. You need to configure it manually by reading the manual guide provided in the package. Lifeline Foldable, portable, non-motorized treadmill machine for home use at low price. Electronic Meter for measuring Speed, Distance, Calories, Time And Pulse. Provision of dual adjustable inclines. Thick and robust metal rods for heavy pounding. Wheels for moving the machine. Workout from convenience of Home in front of TV. No waiting in the lines at the gym, no speeding to the helath club to get in before 'the rush', no walking outside at night in the dark. If you are someone who doesn’t like to wait in the long line of the gym, then this treadmill from Lifeline is perfect for you. You can conveniently use it in your home and workout anytime you want. The Lifeline team cares for you, so they are also providing you bonus material in the package. Guess what it can be? Well, you get tummy trimmer, a sweat belt with red jumping rope. This is a non-motorized treadmill and comes with an electronic meter to measure your overall fat and calories burnt during the workout. In this section of the article, I’ll guide what all you need to keep in mind before buying any treadmill. This is a critical aspect before you finalize your treadmill. The treadmill should have transportation wheels which give you the ability to move your treadmill easily. This will help if you plan to change your house or shift the treadmill from one place to another. This again is another crucial aspect of buying a treadmill. Well, you should always opt for treadmills that have a 2.0 HP DC motor or less and consumes 1 unit for 1 hour. This will help you save energy if you are going to use the treadmill daily at your home or office. This entirely depends for what purpose are you buying the treadmill. If it’s just you and your family and no one weighs more than 90 kg you can comfortably buy treadmills that can bear the weight up to 100kg. However, if you are planning to use it publically where you are not sure about the weight then always opt for the maximum weight available. If you are going to use it for a commercial purpose, of course, you’ll have to buy a treadmill that sports a large display and shows all the required metrics. However, if you are someone who wants to run without tracking anything you can then opt-in for treadmills without screen which will help you cut the overall cost. Does running on a treadmill for a long time can ruin your joints? When you run on a road for a long time, there are high chances you can hurt your joints. However, running on a treadmill cannot ruin your joints as it comes with a rubber soft grip to absorb all the shock instead of giving it to your joints. How accurate are those “calories burned” numbers? Let me be honest with you the calories burnt number shown on your treadmill is entirely fake. Never depend on it all the number shown are calculated and can never show your exact calories burnt. Do I need to wear different shoes on the treadmill? There is no need to buy or wear different shoes on the treadmill. You can use your normal walking or running shoes on the treadmill. 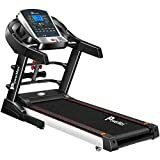 How to decide which treadmill is perfect for me? You need to read all the details about the treadmill which you are planning to buy. Once you have selected the treadmill which you are about to buy, start comparing it with your needs if it completely suits your needs go for it. And if not, repeat the process considering some other treadmill from the list. Having a treadmill at home or office is good as it gives you the full flexibility to be your boss. But choosing the right treadmill for your needs can be a tough choice, and that is why I wrote this guide to make your job easy as a consumer. However, if you are still in doubt don’t forget to leave a comment down below as I’m always there to answer your queries. Protein X Review 2019: Is It The Best Protein Supplement For Indians? Hey Rani, if you can stretch your budget to little over 46k this is the best option money can buy right now in the market. 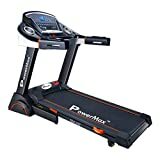 https://amzn.to/2PSiWjt (Powermax Fitness TDA-260). 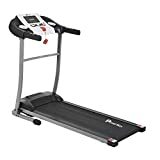 If you’re okay with not having the advanced features like Android support and want to stick with the 40k budget you can go with this one: https://amzn.to/2opSvoP (Powermax Fitness TDM-125S).